The Trinity Force Cobra Stock Kit Features Many Design Elements From A Alpha Style Stock While Incorporating A Host Of Upgrades. The Enhanced Cheek Weld Provides A Ergonomic Comfort And The Recoil Pad Aids In Contact Point Traction As Well As Impact Dispersion. 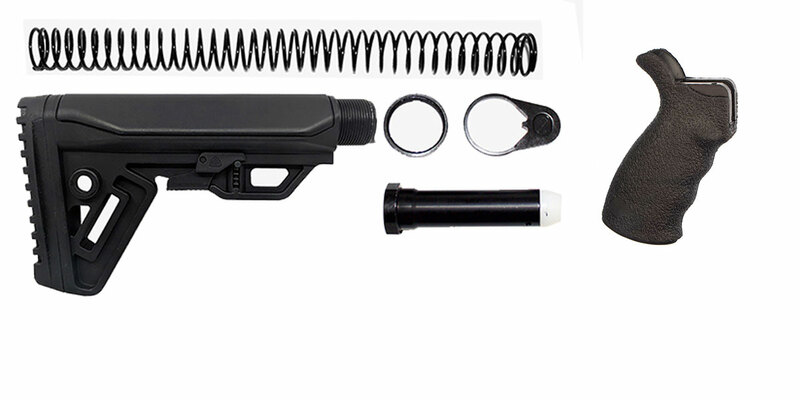 The Stock Kit Comes With Everything You Need To Get Your Rifle Up And Running Including A Steel Endplate, Castle Nut, Buffer, Buffer Spring, And A Mil-Spec Anodized Aluminum Buffer Tube. This Blackhawk Ergonomically Designed Pistol Grip With Finger Grooves Is Comfortable, Prevents Fatigue And Aids In Controlling The Weapon Even When You Wear Gloves. The Aggressive Textured Grip Surface Minimizes Slippage And Is Virtually Impervious To Oils And Solvents Used On Firearms.